“On Tuesday, Nov 20th around 1:30 a.m. 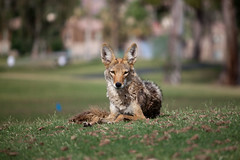 I was driving home and on the corner of College and 21st Ave South I believe I saw a coyote. It was dark and I was able to take a picture. The next day I learned that my neighbor of four cats was missing one and found another half eaten. Around 9:30 pm Monday evening a coyote was on the SE corner of 12th and I believe Lee Street right across from PacMed. He acted like a scared, lost dog. I didn’t know what to do so I pulled up next to him/her and blew my horn. I was hoping to scare it back into Lewis Park but instead it ran across 12th. It looked confused. 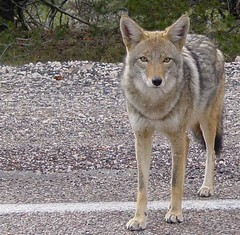 Coyote sightings aren’t unusual on Beacon Hill. We also see raccoons and possums visiting our yards sometimes. Please keep your pets safe. Coyote in the city. Photo by Dru Bloomfield. Skin Deep Dance troupe is performing tribal-style belly dance at Inay’s Asian Pacific Cuisine on Saturday December 11 and again on December 18. Shows are at 7:00 pm and 8:00 pm, and waiter Louie will also appear in drag. There’s no cover, but bring cash for tips. Inay’s is located at 2503 Beacon Avenue South. Photo by emdot via Creative Commons. 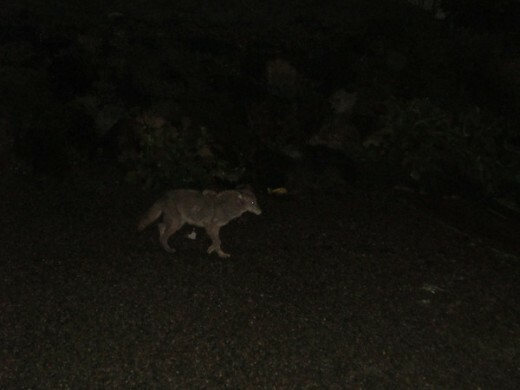 Neighbor Lily sent this report a week or so ago: “I just wanted to report that I believe I’ve heard coyotes howling a lot this morning near Dearborn Park.” We at the BHB have actually seen Beacon Hill coyotes within the last couple of years, crossing the street near 17th and Walker. It’s definitely not a new problem. Please keep your pets safe. El Centro is hosting a tree lighting ceremony later this month. Las Posadas, “A Neighborhood Celebration of the Holidays,” is from 4:30-6:00 pm on Monday, December 20 at El Centro de la Raza, 2524 16th Avenue South. Besides lighting the Christmas tree, the event will feature caroling by the Beaconettes, a visit from Santa, holiday treats, and more. A reminder: El Centro is also selling Christmas trees until December 19. A business named Underground Lighthouse recently applied for a microbrewery liquor license at 2981 South Webster Street. This is not a commercial location, so unfortunately it probably won’t be a Beacon Hill brewpub, but maybe they will sell their beer to some of our local establishments. This appears to be their website. Stencil artist Urban Soule (Kim McCarthy) has art currently hanging at Victrola Coffee on Beacon Avenue. Here is a Facebook gallery of the show. Here is more of the artist’s work on Flickr. The event, a fundraiser for the Pike Market Senior Center and Downtown Food Bank, was held last Friday, December 3 at Westlake Center. 35 choirs competed in front of a large and cheerful crowd. Here are a couple of videos of the Beaconettes’ performance. A bear that gets around? This morning around 10:30, there were reports of a bear sighting near 17th & Ferdinand, and motorcycle officers were dispatched to search southward along the Chief Sealth Trail from about 5000 Beacon Avenue. KING5 and KIRO-TV have preliminary reports. If this turns out to be the same bear that made the news up north earlier this week, that bear really gets around! 11:50 Update: The P-I reports paw prints and a gnawed-on ice cream container found near the Beacon Hill P-Patch. And KOMO now has initial coverage. 1:30 Update: The Weekly on the false bear alarm. 2:15 Update: The P-I now has pictures of the P-Patch tracks. 6:00 Update: The Big Blog has a photo of the ice cream evidence and Blogging Georgetown breaks out the hazard stats for black bear attacks.